Want to make web pages SEO friendly? Then this on-page SEO checklist is for you. When it comes to increasing search rank, optimizing on-page elements is the starting point for SEO managers. It requires technical SEO knowledge and savvy, and when done well can improve SEO rank on the spot. 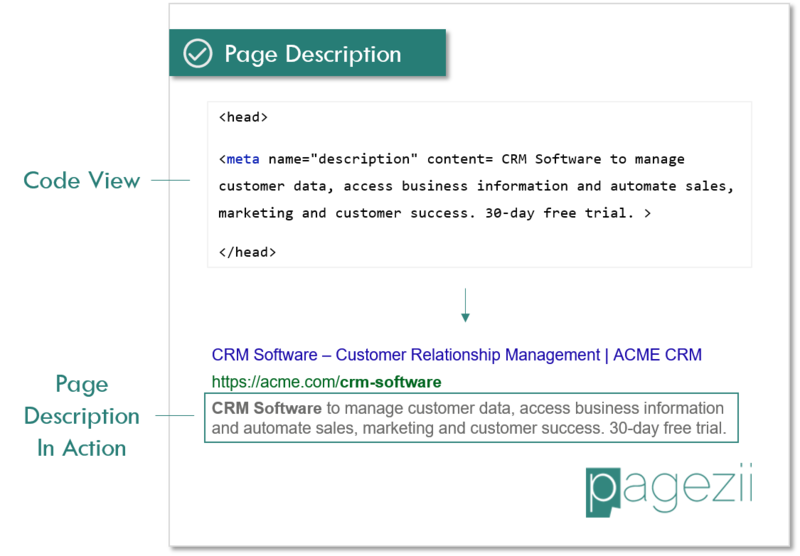 Before we dive into the nuts and bolts of on-page SEO, let’s lay out a basic definition of the practice. On-Page SEO Definition: On-page SEO is the process of improving a web page’s code and content to increase search engine rank for a target keyword. To do this, SEO Managers mention a target keyword in important page elements which Search Engines look for when crawling page content and ranking search results. Higher search engine rank for a target keyword drives more organic visitors to your site. Interested in technical SEO? 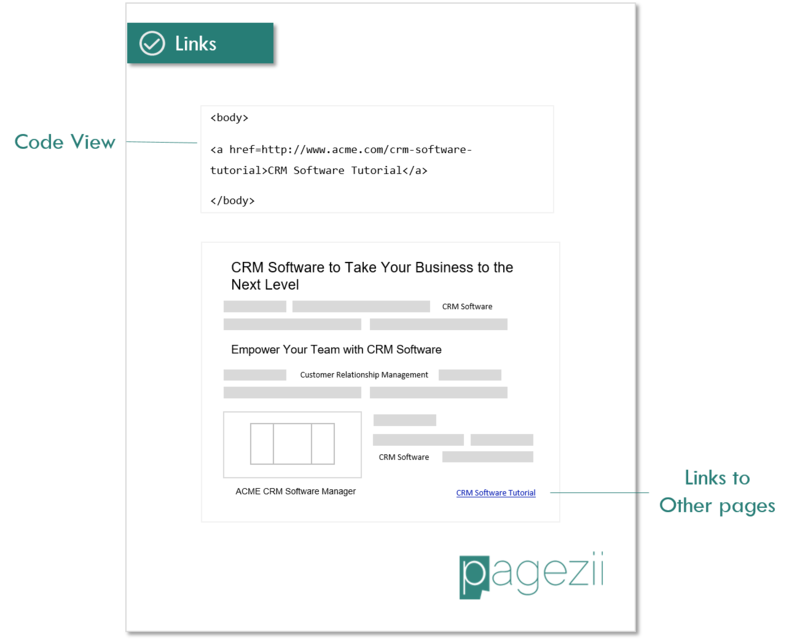 Download the On-Page SEO Checklist. The starting point for improving a page’s search engine rank is to optimize on-page SEO factors. Here is an on-page SEO checklist you can use to optimize web pages. Meta tags provide structured data to search engines and are found under the head section of a webpage. Why optimize meta tags? Because they provide search engines like Google with information about a web page. This helps search engines understand and categorize your content properly. 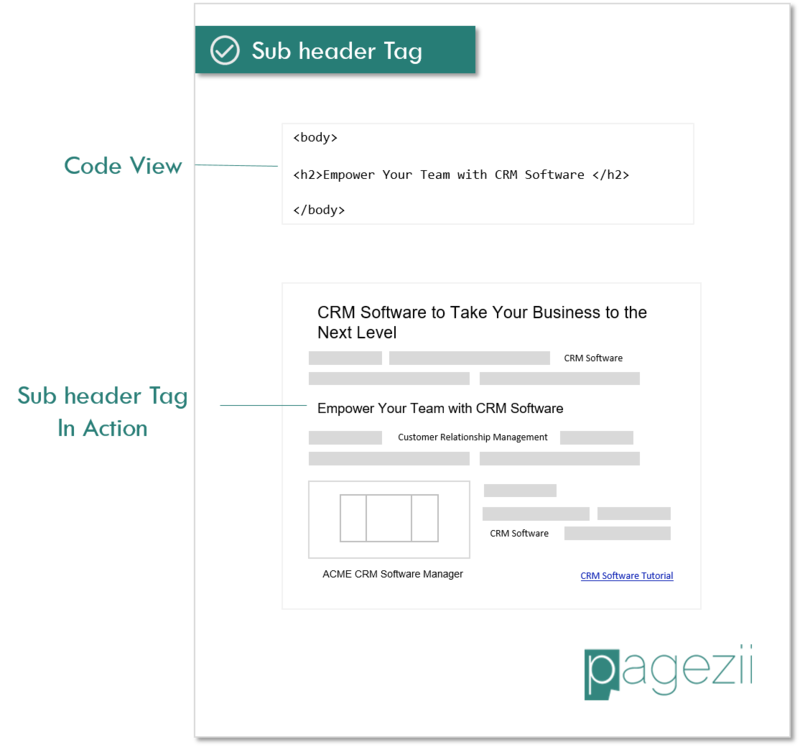 Let’s dive into specific meta tags that you can optimize. Pagezii Tip: You can easily see meta tags at work by right-clicking on any webpage and selecting “view page source”. Meta tags are found between <head>…</head> elements. Optimization Tip: It’s essential to include your target keyword within your page title. To get the most out of optimization, lead the page title off with the keyword you’re targeting. The closer the target keyword is to the beginning of the page title, the more likely a user is to click. It takes less mental effort for a user to process what a page is about when the keyword searched for is seen first. Also, keep page titles to 60 characters max (including spaces.) Anything more and you risk having your headline truncated. Page description is also used in a web page’s search engine result. It’s shown as the gray text lines that give more insight into what your page is about. Optimization Tip: Optimize your page description by using the target keyword early on. You have a lot more space to work within the page description, but you don’t want to go keyword overboard. A page description should accurately describe a page’s content. A good rule of thumb is to use the target keyword naturally and write the description for human eyes. Now we’re getting a bit more technical. 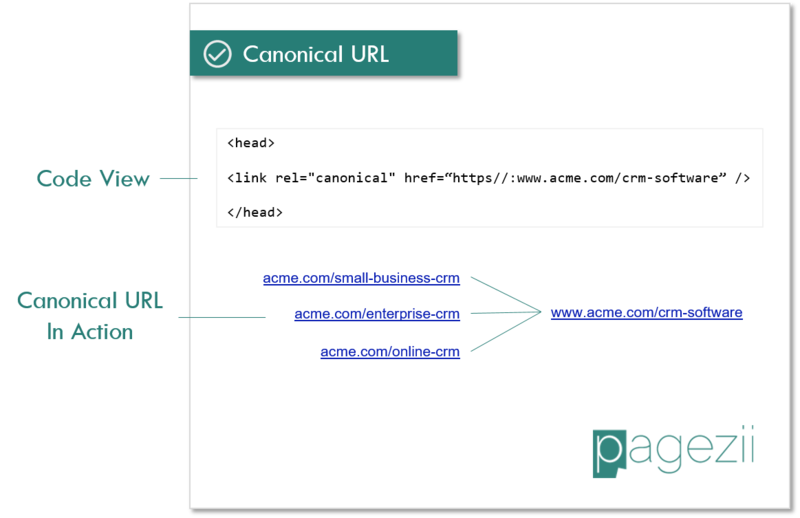 The canonical URL tag directs traffic to a preferred web page. Optimization Tip: Using canonical tags consolidates visitor traffic to a single web page. This helps strengthen a search engines information for a preferred URL. Canonical URLs also helps you track visitor data much better. Traffic coming from different URL sources complicates metrics. Using a canonical URL will keep your data organized. 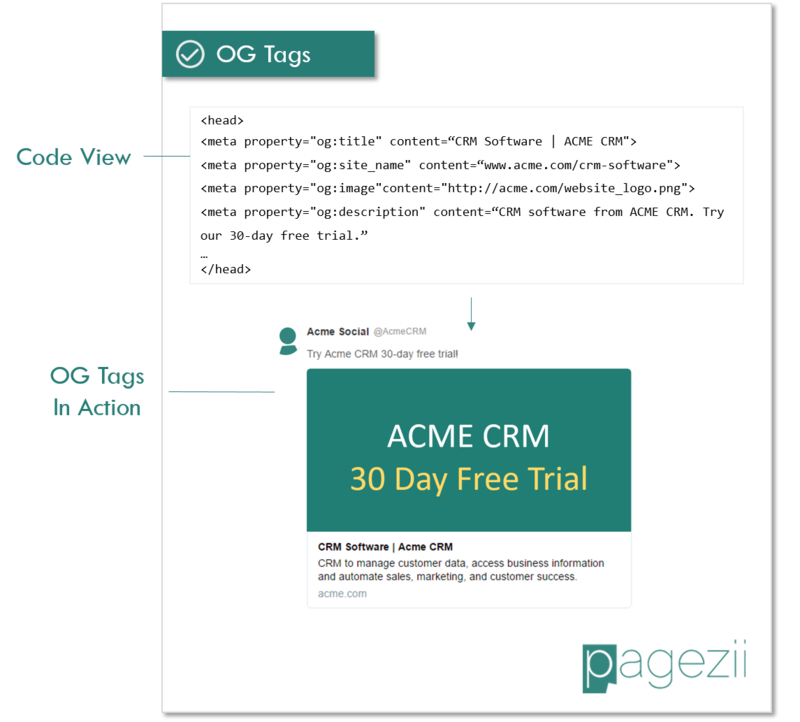 Open Graph tags provide data for your web pages on social media platforms. When sharing your page on a social platform, OG tags will essentially turn that link into a rich object. Optimization Tip: Optimizing OG tags indirectly affects a web-pages SEO performance. Customizing your page’s OG tag data (title, description, images, etc.) creates an optimized rich object. This leads to higher volumes of engagement and opens the door for web page mentions and backlinks to your content, which will improve SEO. Information between <body></body> tags is what visitors actually see on a web page. This includes everything from your page headings, text images, and links. 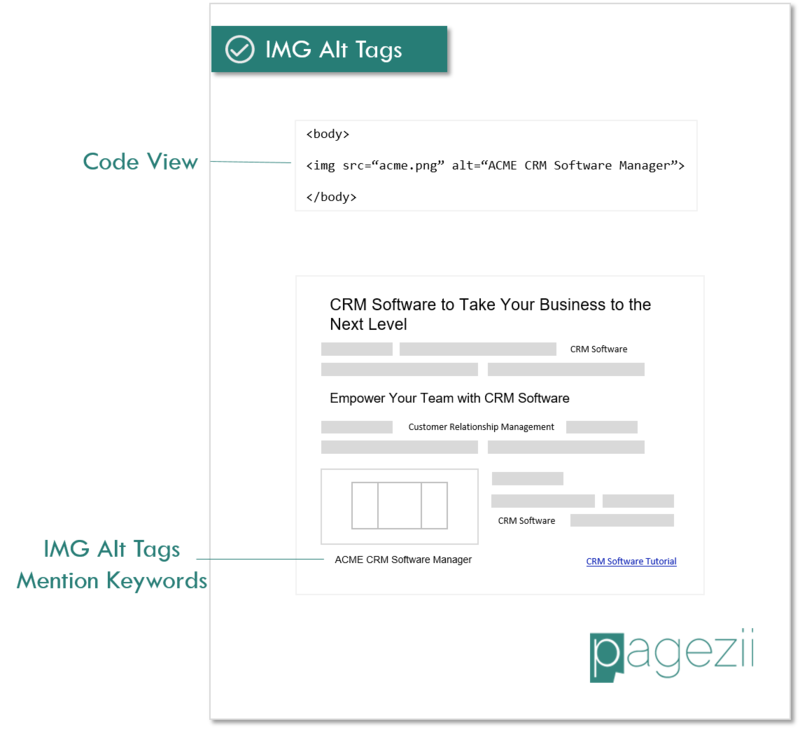 Optimizing page body information with a target keyword in mind is important because it helps search engines understand what your web page is about. When optimizing body tags, keep in mind this is the information that visitors see. This means you’ll want to keep the natural feel of page content. Don’t try to force keyword optimization, because this leads to a poor user experience and will end up hurting your SEO efforts. 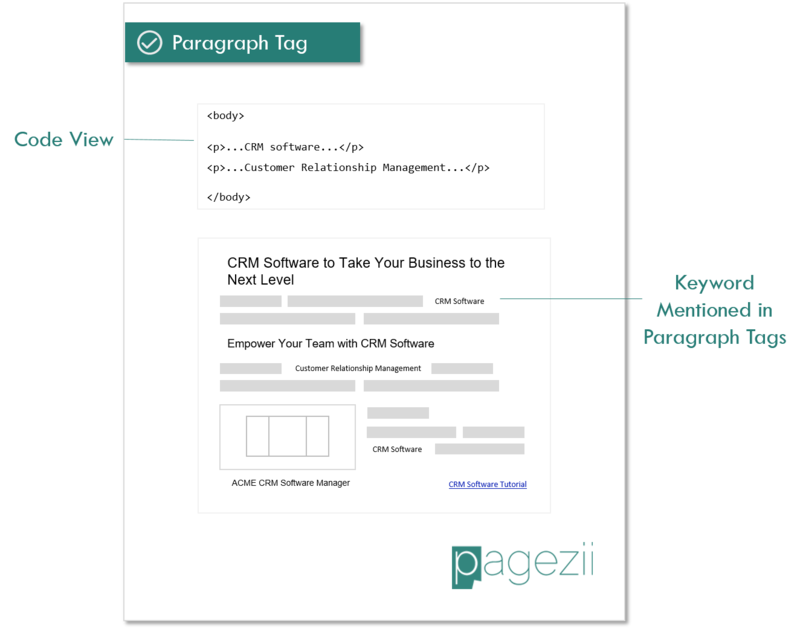 Pagezii Tip: You can easily see meta tags at work by right-clicking on any webpage and selecting “view page source”. Meta tags are found between <body>…</body> elements. Here are important body elements to focus on for on-page SEO. A page header introduces content to a user and is the most prominent text on a web page. Because headers typically encompass an entire page’s content, optimizing for a target keyword isn’t too difficult. Optimization Tip: Mention the target keyword in your page header. 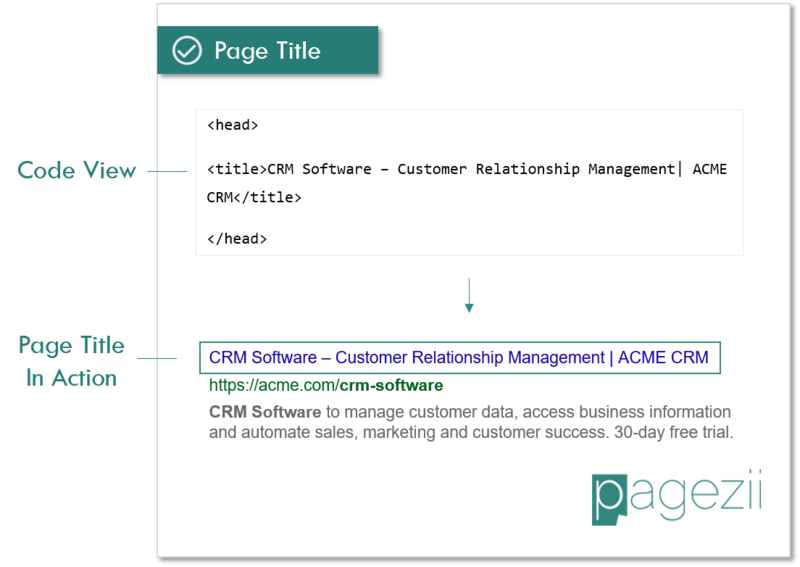 As soon as a user lands on your page after clicking your search engine result, they’re introduced with a header that matched their query. When a search engine crawls your page, it can easily determine what your page is about. Sub-headers breaks your content down into digestible sections. It’s also a good idea to drop your target keyword in your sub-headers when possible. Optimization Tip: Your web content may use a number of sub-headings throughout the page. This is good practice from an SEO perspective because sub-headers make content easier to consume. This means visitors will stay on your pages longer and click-through to other content on your site. This improves SEO. For direct on-page SEO results, try mentioning the focus keyword whenever possible. The key here is to not force keywords into sub-headings. This may come off as spammy to your visitors and search engines and can hurt your page’s SEO. Now we’re getting into the finer details of page optimization. Paragraph text is the meaty information of your web page. Optimization Tip: Your page text content will most likely mention the keyword you’re targeting. Keep in mind how often the keyword is mentioned. This is called keyword density. Search engines may think you’re spamming your readers. Aim for a keyword density of ~12%. This means for every hundred words, mention the target keyword. Using latent semantic keywords is also good from an SEO perspective. These are keywords that are close in meaning to your target keyword. This is a great strategy to help search engines understand what your content is focused on. Images do a lot for your web page. They explain key ideas of your page, convey a tone or message and act as a visual break in content. And yes, optimizing images plays a big role on-page SEO. Optimization Tip: You’re able to optimize images using the alt image tag. The alt image tag provides a text description of your image. Search engine page crawlers can’t actually see your images to determine what they are or how they relate to your content. This is why a text description is important. External links that send traffic to other sites – e.g. Wikipedia for more information. Linking to content that is related to your page provides more context to search engines. 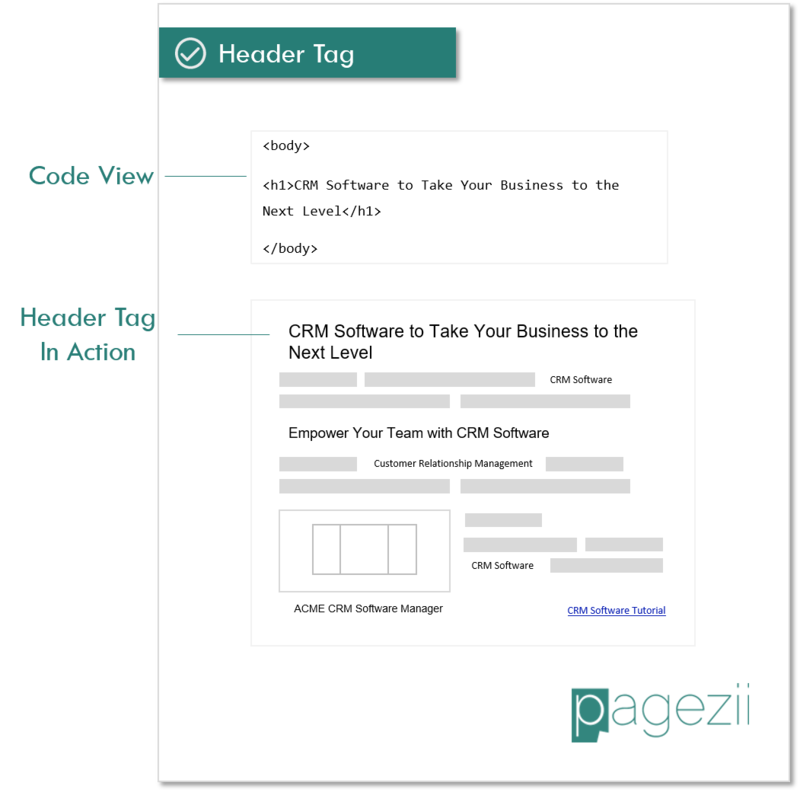 We’ve covered the fundamentals of optimizing on-page SEO elements. 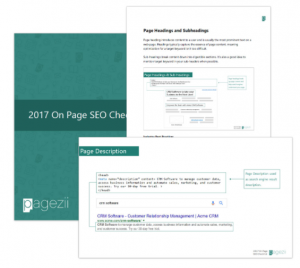 Use the Pagezii on-page SEO checklist to increase your web pages organic rank in search engines.